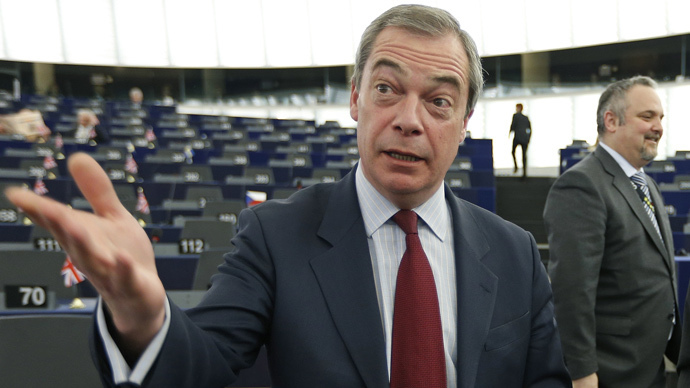 Britain's Nigel Farage launched a stinging attack on the idea of an EU army to counter Russia. The UKIP leader also placed some of the blame for the Ukraine crisis on EU expansion. The notion of building up an EU army to counter Russia was the brainchild of European Commissioner Jean-Claude Juncker. Farage quickly noted that the idea is already happening, despite many European leaders being against it. He pointed to a conversation he had with Nick Clegg – leader of the Liberal Democrats and the UK's deputy prime minister – a year ago, during which both men agreed that the idea of a European army was a dangerous fantasy. Farage then cited examples of the European Defense Agency, EU battle groups, an EU Navy operation against pirates off the coast of Somalia, and article 28 of the Lisbon Treaty, which provides for collective EU defense. He went on to say that the EU was the catalyst for the conflict in eastern Ukraine, due to its territorial expansion. “We poked the Russian bear with a stick and unsurprisingly Putin reacted,” Farage said. Harking back to the words of former British Prime Minister Tony Blair, who said “the EU is not a project about peace but a project about power,” Farage accused Juncker of being opportunistic by calling for an EU army. “Who do you think you’re kidding Mr. Juncker?,” Farage said. The comment was a reference to the sitcom 'Dad’s Army,' in which a group of old men try to fight off a German invasion. The show featured the lines “Who do you think you’re kidding Mr. Hitler, if you think old England’s gone?” Farage's comment was met with laughter from British MEPs. “We do not want any part of an EU army and I doubt the peoples of Europe do either,” he added.